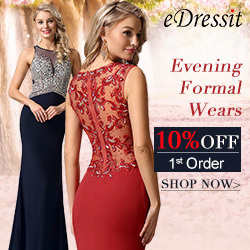 eDressit Fashion Blog: How to Choose the Best Mermaid or Trumpet Evening Dress? How to Choose the Best Mermaid or Trumpet Evening Dress? If you decide to choose hot mermaid dresses or trumpet evening dresses, you should know how and what are the factors that will influence your look. Now, we list several tips and factors to make you get the right dress and to be perfect at your party occasions. The flare width of the skirt at the bottom has many variations depending on the style of the dress. A narrow flare will look a lot like an A-line skirt but wider a little and will have a subtle effect on your overall appearance. A wide flare meanwhile will give off a dramatic feel, one that will glue all eyes on you. A wide flare though will also make you unbalanced (bottom heavy). To counter that, you could don a notable hairstyles or heavy jewellry. 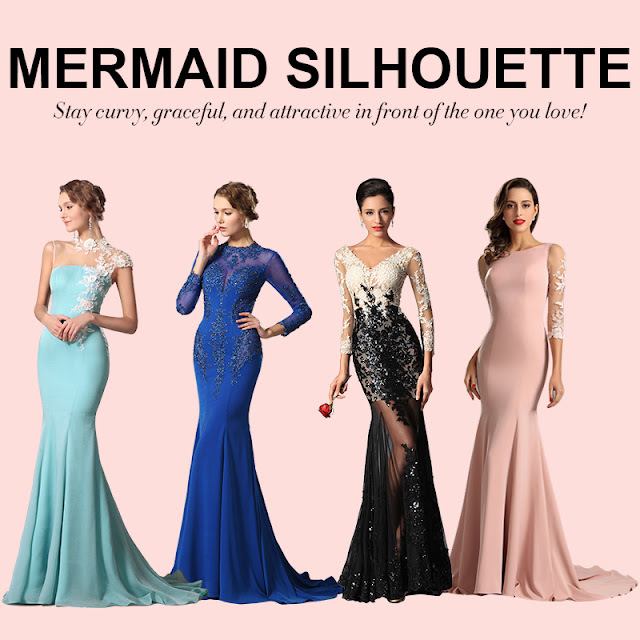 Mermaid or trumpet evening dresses with wide flare is especially ideal for women with broad shoulders because it helps balanced up your silhouette. Do also take note that wide flare will cut off your height. So if you’re short or petite, it’s advisable to go for mermaid or trumpet evening gown with narrow flare skirt. Where the bottom skirt start to flare out is the flare height. Flare starting at mid-thigh is called trumpet as you learned earlier, will show off your torso, hips and buttocks but will be able to hide problem thigh. Skirt that starts to flare out from the knee (mermaid), will reveal your torso, hips, buttocks including your thighs. If you’re yearning for an hourglass shape, choose trumpet evening dress. If you want to create a dramatic mermaid look, then mermaid evening dress is the best choice. No matter which style you choose, both are elegant looking. If you want to draw attention to your waist, you could choose trumpet and mermaid evening dresses that comes with belt or sash. If it didn’t come with one, you can easily shop for one or made a simple sash for yourself. The addition of belt will flatter your curves even more. Do know that adding a belt or sash is perfect for simple (bare) & usually not embellished mermaid or trumpet dress. If the dress has many embellishment, it’s not wise to wear a belt then. Material use for the flare play an important role to how the final look of your evening dress is. When the flare material is made from the same material as the dress, it offers a streamline shape that makes you taller and slimmer. The material can be chiffon, satin, silk, organza or lace. For sensational flare, different materials are used for the top dress and flare. It can be an embellished top (like beading, embroidery or applique) with tulle flare or ruched top with ruffles with tulle flare. The different materials create a distinguished line between the upper bodice and flare which is well harmonize by beading or other embellishment to create a fluid flow. Ruching are sometimes present on the upper bodice. It can be horizontal or asymmetrical. If you’re petite or short, choose mermaid or trumpet evening gown with asymmetrical ruching which will not swallow your height. If you’re tall, you can choose between horizontal or asymmetrical ruching. I wouldn’t suggest ruching for apple or full-figured women as ruching can add bulk. Mermaid & trumpet evening dresses can vary between sleeves and sleeveless. If you’re uncomfortable in showing too much skin in a sleeveless mermaid dress, opt for sleeves instead which come with a variety of length such as short sleeves, ¾ sleeves or long sleeves. One of the reason why both mermaid and trumpet are bombshells silhouette is because they emphasizes your hips especially. Mermaid formal dresses really flatters the hips. If you want less emphasis on your hips but still want to rock this type of silhouette, go for trumpet evening gown instead. Know that your movement can be restricted in a mermaid evening gown because of the fitted top that span from upper bodice to knee. If you are doing lots of walking and/or dancing, choose trumpet evening dress instead which is less restricted. Some mermaid evening dresses come with the addition of train which glide beautifully with the flare skirt as you walk. It adds elegance and gracefulness. For women looking to add extra height, train is a good choice. Do know that mermaid or trumpet evening dresses with train are more suitable for indoor function rather than outdoor (grassy or sandy) which will dirtied the train.